Painting Acrylic on Canvas | 42" x 60"
Painting Acrylic on Canvas | 84" x 42"
If I could, I would have painted the world with the colours of my imagination. I love playing with bold and vibrant strokes and my paintings show a fine blend of surrealism and classicism. The beauty and the grace of the female form have always inspired me so a lot of my latter collections are based on that though my first love will always be nature. I would love to capture the beauty of everyday life and make it appear wondrous on my canvas. Nilesh Pawar, an artist of considerable repute, did his diploma in Drawing and Painting from L.S Raheja School of Arts in Mumbai. 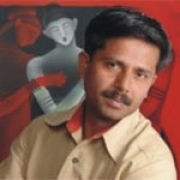 He has also completed the diploma in Art Education from Abhinav Kala Mahavidyalay in Pune. He held his first solo exhibition at the age of 25 in Studio 51J Art Gallery and Pradarshak Art Gallery in Mumbai. Since then he has held 7 solo exhibitions in Mumbai and Pune along with more than 15 group exhibitions in all galleries across the country including the Jehangir Art Gallery, Mumbai. Nilesh won his first award at the age of 20. He won the first prize for realistic landscape from Kalavishwa Mahavidyalaya. Nilesh has been the recipient of prestigious awards like JR Mistri Memorial Cash Award (1999), Merit Award Chitari (2003) and Europe Tour Award (2004).